It’s simple. We just don’t have enough sockets in our homes to run all the electrical appliances we are using these days. In the kitchen, for example, you’re likely to want a dishwasher, a washing machine, a fridge (and, perhaps, a freezer as well), a toaster, a deep-fryer, an oven or two, a microwave, a radio and a TV – not to mention the extras like food mixers and coffee machines! So if you’re running out of sockets – in the kitchen or anywhere else – we’ll be delighted to come and fit any of a wide range of additional sockets to meet your specific needs. One thing you do need to remember, though. If you’re looking at a wall that doesn’t have a socket on it already, you won’t be able to use an electrical appliance on that wall without also using an extension lead. Looking for a quick fix? Then we could – if you wish – put cables into white plastic trunking and run them along the wall to surface-mounted sockets. This avoids disturbing the walls and decoration and helps keep disruption and dust to a minimum. Alternatively – for that flush look – we can bury the new wiring and the additional sockets in the wall. This option is only recommended if you are redecorating, because you’ll need to replaster the wall after we’ve finished – but if that’s what you want, don’t worry. 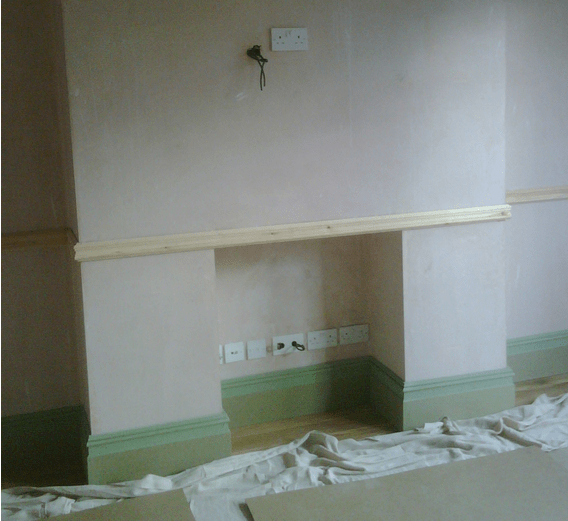 We can recommend trusted tradesmen we have worked with in the past to ensure you get the finish you want. Fitting additional sockets is the one job we are most often asked to do – which is hardly surprising. Mothers are always the first to say that you can’t have enough sockets in your home!